Improving balance in senior populations is important for the prevention of falls and provides individuals the physical skills to perform daily tasks with confidence. Although there are many strategies to address this concern, all methods require consistent practice (i.e., the “use it or lose it” principle). 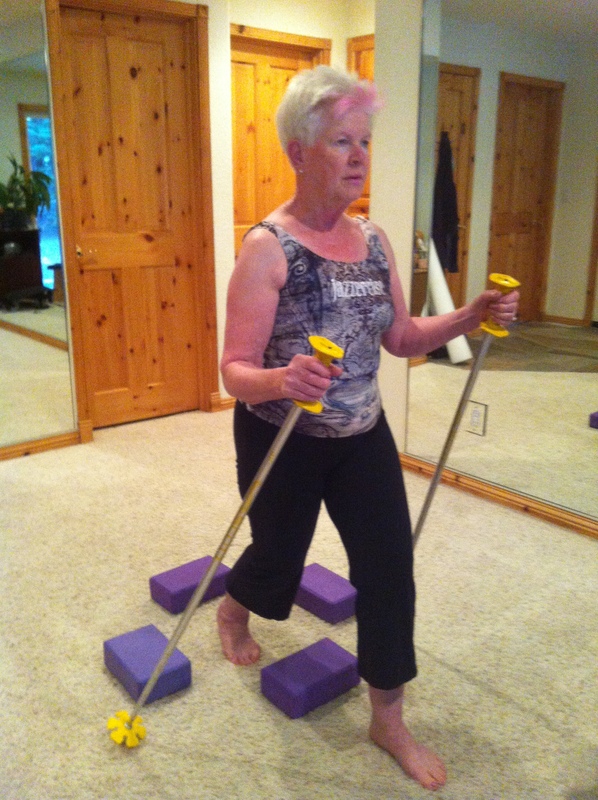 It is not uncommon for an older client to express surprise at the level of difficulty with such skills as balancing on one leg, shifting weight from leg to leg, or walking on a straight line. The good news is that unsteady balance can improve dramatically with consistent practice. Yoga blocks can be used as an excellent tool to practice such balance skills as picking up one’s feet to clear an object, balancing on one foot, transferring weight from one foot to the other, and staying balanced while shifting the center of gravity. According to the article “From Athletes to the Elderly: The Science of Trips and Falls” the body uses multiple sources for balance information. As people age there is often deterioration in one or more of these systems. 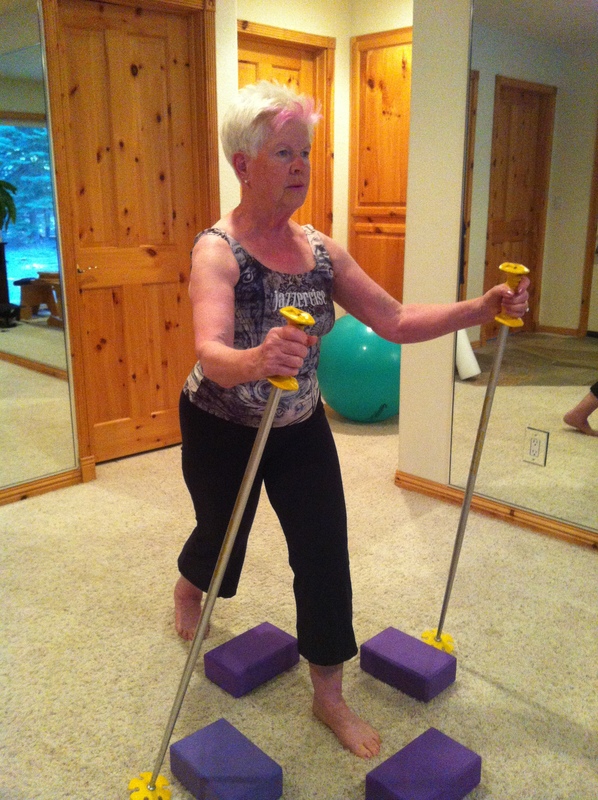 Improving core strength and regularly challenging oneself by performing balance-related exercises can allow older adults to adapt to unstable surfaces or other unanticipated obstacles to avoid falls. In addition to preventing falls, steady balance is a quality of life issue for older adults. Getting dressed is a basic example of this. To put on a pair of pants or to slip into shoes requires standing on one leg. When older adults lose confidence in their abilities, they will often sit down to perform basic functions. Fear of injury due to lack of confidence in physical skills will likely lead to moving less and doing less. Many older adults lack the knowledge and training that a physical coach or Pilates instructor can provide. In the short term, there is often a modification or different strategy available that can be employed to approach a daily task. In the long-term, strength and flexibility along with coordination and balance training can make a significant difference in the physical well-being of seniors. Providing guidance and strategy to seniors as they navigate the aging process allows them to continue the activities they enjoy. 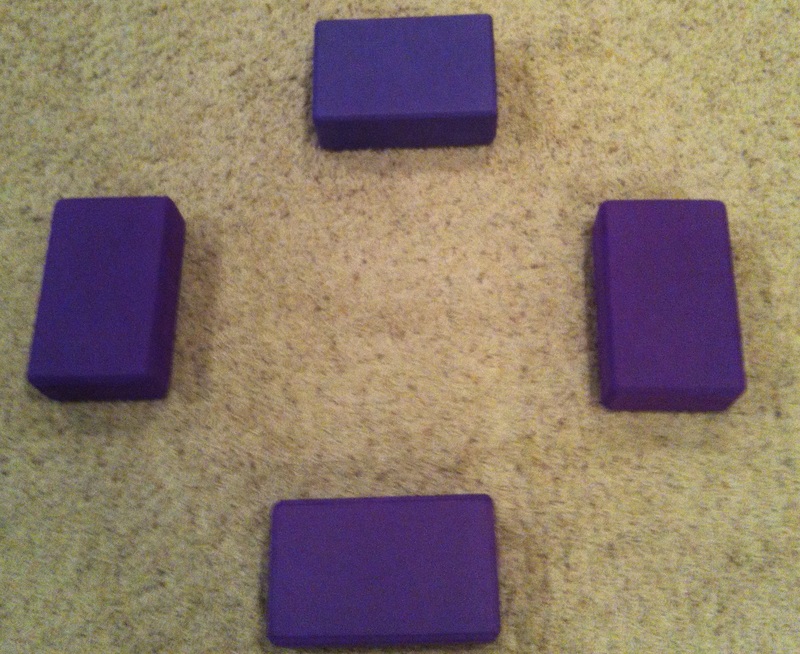 Place 4 yoga blocks in a square with enough space for a person to stand in the center of them and space available to comfortably step over them. Firmly hold the hands and wrists of your client for additional support or let your client use hiking or ski poles. Once confidence and skill improves, the exercises can be done without assistance. 1. Step the left foot over the front block with equal weight on each leg in a forward lunge position and the spine in a centered vertical position. Return to the starting position in the center of the blocks. Repeat the step forward on the right leg. 2. Step the left foot over the left side block with equal weight on each leg in a centered squat position. Return to the starting position in the center of the blocks. Repeat the step side on the right leg over the right block. 3. Step the left foo t backward over the block with equal weight on each leg in a back lunge position and the spine in a centered vertical position (not pictured). Return to the starting position. Repeat on the right leg (note the picture shows this–right foot is back). Be aware that your client may try to “cheat” by going around the side of the block, rather than over the block. This exercise is designed to give your client proprioceptive feedback since they will kick the block if the foot is not picked up sufficiently. The pattern above and all subsequent ones can be varied by starting on the right leg or doing repetitions of a step (example: 4 sets of left/right over the front block before moving to the side; or stepping the left foot forward and back over the front block 4 times before stepping over the front block with the right foot). Varying the patterns requires your client to pay closer attention and apply the applicable pattern of the day. 1. Step the left foot over the front block landing with a bent left knee and straight right leg. The majority of the weight is on the front leg and the spine is on a 45 degree angle forward. Be sure your client’s knee lines up over the ankle (not off center or with the knee over the toe or beyond, which creates too much forward pressure to the quadriceps). Return to the starting position with a rebound feeling by pressing the front heel into the floor and engaging the left hamstrings. Repeat forward lunge on the right leg over the front block. Unlike the Centered Weight Shift version above where the core was centered equally between the legs, this version requires more core adjustment by shifting the weight off center and back to center challenging the awareness of the center of gravity. 2. Step left foot over the left side block landing with a bent left knee and s traight right leg. The majority of the weight is on the left side leg and the spine is on a 45 degree angle sideways to the left. Again, look for the lineup of the knee and foot. The step to the side can be done with a parallel leg (toes pointing forward) or with an externally rotated leg (toes point outward). Return to the starting position with a rebound feeling by pressing the left heel into the floor and engaging the left hamstrings. Repeat side lunge on the right leg over the right side block. 3. Step the left foot backward over the block (not pictured) with the chest over the back leg landing with a bent left knee and straight right leg holding the core to support the low back. Return to the starting position with a rebound feeling by pressing th e back heel into the floor and engaging the left hamstrings. Repeat this back lunge on the right leg (note the picture shows this–right foot is back). The majority of the weight is on the back leg and the spine is at approximately a 45 degree angle backward with the chest over the back foot. It is acceptable to slightly rotate the back foot out if needed, but since this tends to also rotate the pelvis, the exercise is more challenging if the back leg is parallel and the hips are “square” to the front. This exercise can be done with either the Centered Weight Shift or Weight Transfer version above. The right foot remains in a stationary position while the left leg steps forward over the front yoga block, rebounds and returns center; steps left side over the block, rebounds and returns center; steps left back over the block, rebounds and returns center. Repeat with the right foot stepping the right foot over the front, side and back block. The pace of the exercise is a bit faster so the adjustments need to be made quicker. Vary the pattern by starting with the right leg, repeating positions more than once or starting the exercise to the back. This variation of the exercise is useful to do initially in front of a mirror since it requires that the client step backward over the block. The mirror can be used to see the yoga block and judge the distance and size of the step better. 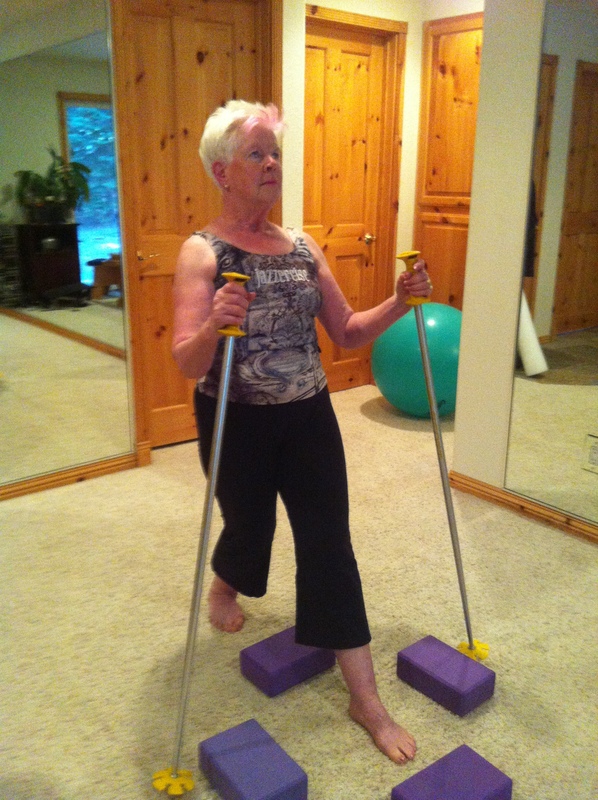 Be sure to assist the client supporting the hands/wrists or use the hiking/ski poles until they are no longer needed. 1. Step the right foot over the front block followed by the left foot to completely step over the yoga block. Step the right foot backward over the front block followed by the left foot to return to the starting position in the center off all the blocks. Be sure your client goes over the block, not around it. This requires momentary balance on a single leg and picking up the feet. 2. Step the right foot over the right side block followed by the left foot to completely step over the yoga block. Step the left foot sideways over the side block followed by the right foot to return to the starting position in the center off all the blocks. 3. Step the right foot over the back block followed by the left foot to completely step over the yoga block. Step the right foot forward over the back block followed by the left foot to return to the starting position in the center off all the blocks. 4. Repeat the entire pattern above starting with the left leg lead going completely over the front, side and back block to finish in the center of all the blocks. Again, the patterns can be varied starting with the left leg, mixing front right/left leads before moving into the side or back positions, starting the exercise to the back, etc. This is an advanced exercise to be completed only after the above skills are acquired and your client feels confident. 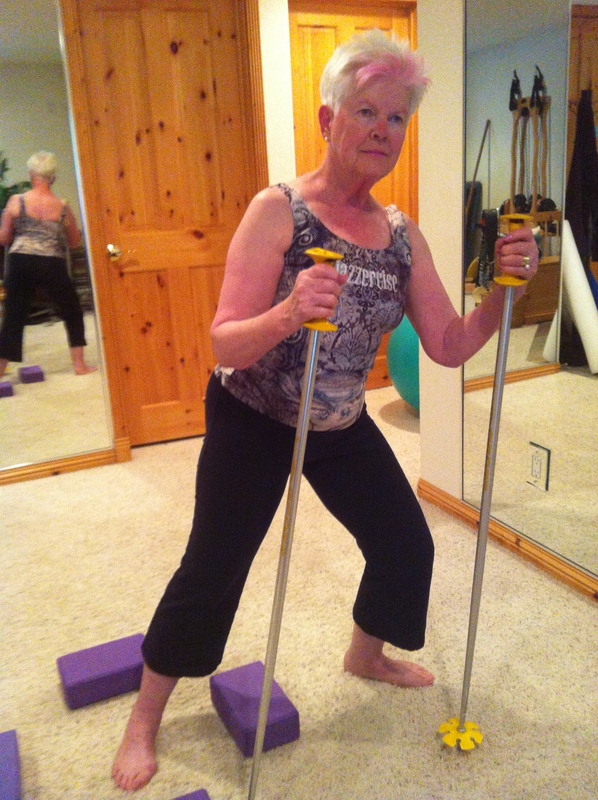 Be sure to have your client master the skill of balancing on one leg with the eyes closed and taking steps forward, side and back with the eyes closed prior to trying this exercise with the yoga blocks. Be sure to assist your client by supporting the hands/wrists or carefully spotting each step so that your client does not trip over the blocks. Try any of the above exercises: Centered Weight Shift, Weight Transfer, One Leg Rebounds, or Stepping Over with the eyes closed while carefully assisting to make sure your client does not trip. Advise your client to feel the floor with the toes on the other side of the yoga block prior to transferring the weight. 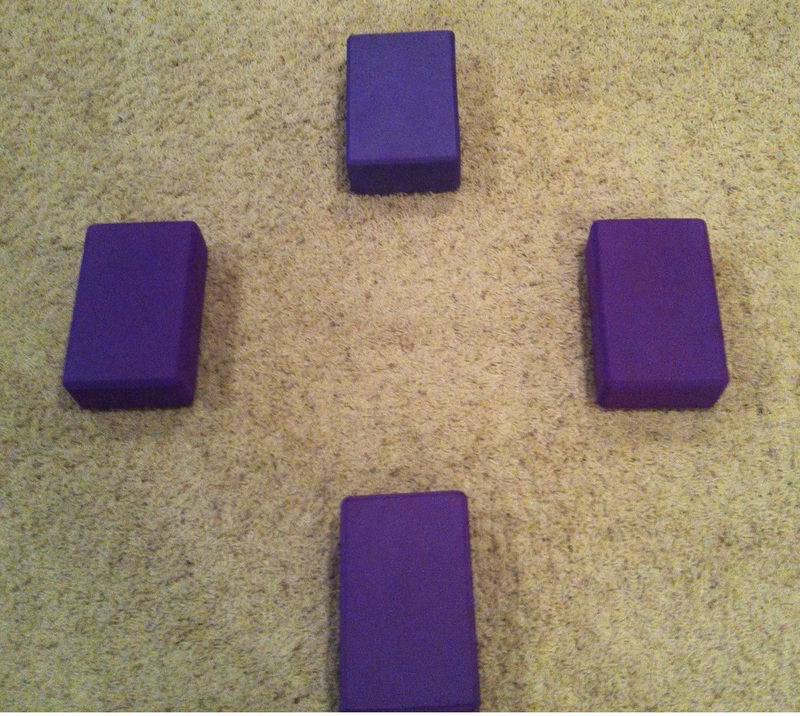 Move the front and back yoga blocks a quarter turn so that all of the four blocks line up in the same direction with enough space for a person to stand in the center of them. 1. Step the right foot forward up onto the front block to balance on the block on the right leg with the left foot suspended off the floor. Step the left foot back down to return to the starting position. Rep eat on the left leg stepping up on the front block (shown in picture). Return to the starting position. 2. Step the right foot up sideways onto the right side block to balance on the block on the right leg with the left foot suspended off the floor. Step the left foot back down to return to the starting position. Repeat on the left side using the left side block. 3. Step the right foot backward up onto the back block to balance on the block on the right leg with the left foot suspended off the floor. Step the left foot back down to return to the starting position. Repeat on the left foot stepping up on the back block and return to the starting position with the right foot joined by the left. All of the above exercises require core strength, leg strength and ankle stability. If you feel that your client is deficient in one of these areas and cannot successfully perform the exercises outlined above, try doing some basic exercises that boost these skills prior to working with the yoga blocks. Although the yoga blocks are useful tools since they are a good height and size for practice, any obstacle is acceptable. Envelopes can work well as a target to step over if picking up the feet is too difficult. A client can practice at home stepping over books, shoes or even cracks on a sidewalk. If your client is unstable, assign a preparatory exercise to stand on one leg in a doorway holding the doorframe or holding onto a counter for stability. Make sure your client’s home practice is commensurate to skill. The loss of balance can feel like a loss of control in the lives of older adults. It is unfortunate that many seniors begin to give up activities simply because they feel unsteady and fear they may fall. The building blocks for better balance are available to everyone, but require a commitment to practice and a systematic plan. Getting older does not have to mean a wobbly future. Balance can be relearned and continuously improved. Practice may not always make perfect when it comes to balance in older adults, but the progress is definitely worth the effort—ask anyone who can now put on pants one leg at a time.